Coordinate a group of dissidents or suppress dissent in NewSpeak - a new code-breaking team game of subterfuge, set in a bleak future for 3-6 citizens. 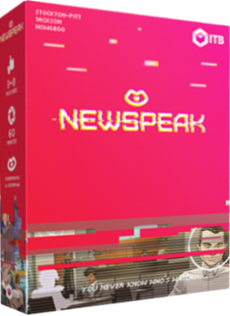 NewSpeak is a tense game of dystopian subversion in which you take the role of either the 'dissidents' or the 'moderators' in a mind-bending battle of wits to determine the reality around you. Dissidents utilise matching underground codes to coordinate meetings at one of the locations on the map. They then each secretly use their location dials to declare their intended meeting point. Depending on whether the majority of Dissidents have successfully coordinated at a single location, or the Mods have caught them in an attempt at subversion will determine whether that location becomes 'hacked' or 'moderated'. The game's Kickstarter project is currently ongoing, so take this chance to fight for future reality.